NAGPUR – Ryan Campbell looked the part at the top of the order for Hong Kong at the start of its Group B first round World Twenty20 tie against Afghanistan, reported ICC. The oldest Twenty20 International debutant didn’t look out of place when the pacers were on, barring when the ball pitched half-way down the pitch, and he didn’t have too many issues against the spinners in making 27 from 24 balls. That’s the one thing Hong Kong ticked off the to-be-improved list on Thursday. The rest of that list remained un-checked, and it cost them as Afghanistan put on a no-frills performance at the Vidarbha Cricket Association stadium in Nagpur to make it two wins in two. Zimbabwe, who, earlier in the day defeated Scotland by 11 runs, also has two wins from as many games. The winner of that contest on Saturday will make it to the Super10 part of the event. As far as the contest at the VCA went, Hong Kong, opting to bat, was first thoroughly outdone by Afghanistan’s bowlers, who reduced Tanwir Afzal’s men to 116 for 6. Then it was the turn of Mohammad Shahzad and Noor Ali Zadran to blast Hong Kong out the contest as Afghanistan cruised to 119 for 4 with 12 balls to spare. As expected, Shahzad was once again the crowd pleaser. Understanding that his side didn’t need to score at a frenetic pace to erase the deficit, Shahzad, the 28-year-old, took his time to settle in but once in he smacked two sixes and four fours on the way to a 40-ball 41. And yet, if Afghanistan were asked to name the primary reason for this comprehensive win, nine times out of ten they would pick the bowling unit. Every plan they had in place for Hong Kong, they executed, and the helm of that business-like performance was Mohammad Nabi. First, there was Campbell. He was a tad unlucky to have the ball loop over him off his glove and crash into the stumps, but it was flight that led him into that awkward sweep. It was the least convincing of Nabi’s wickets but he won’t be complaining. Then, there was Babar Hayat, who was drawn into chipping the ball to Samiullah Shenwari at midwicket, in the same over. Nizakat Khan was the next on Nabi’s list and this was a result of a smart piece of bowling. Seeing Nizakat step down a bit, Nabi fired the ball well outside off and Shahzad, the keeper, caught the batsman out of the crease. The last of Nabi’s victims was Kinchit Shah, who went for the big shot and ended up edging to short midwicket. Nabi covered quite a bit of ground and completed that catch to round off his spell having conceded a mere 20 runs. Nabi’s form wasn’t the only bright spot in their bowling. Hamid Hassan, who replaced Amir Hamza, showed that his recovery from the thigh injury was complete by bowling four niggle-free overs and giving away just 17 runs. Dawlat Zadran was once again on top of his game, giving away 24 from his 4. Rashid Khan, the leg-spinner, too played his part to perfection. 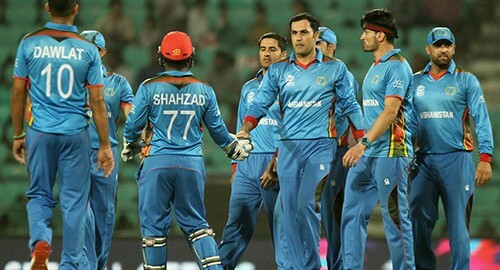 Now, 117 runs isn’t really a big task for a side like Afghanistan who boast many hard-hitters. But on a pitch that isn’t conducive to batting, it seemed a bit more than that. Never mind, Afghanistan was off to a flier with Shahzad and Noor Ali adding 70 runs from 63 balls for the opening wicket. Following Shahzad’s dismissal, Nabi, Noor Ali and Shafiqullah all were sent back — two by Campbell, but the game was done a long, long time ago and Najibullah Zadran only ensured the formalities were completed with three successive fours.